A deserted lab on P3R-233 contains a mysterious shimmering mirror. When Daniel touches it, he finds himself transported to an alternate reality where nothing is quite the same. The Earth of this reality is under attack by the Goa'uld, and billions have already died. 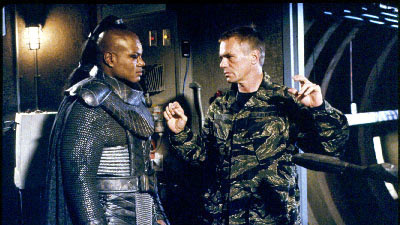 General O'Neill is in command of the SGA, and must confront Teal'c, still the First Prime of Apophis. Earth is unable to defend against the attack, and Daniel's only hope is to escape through the stargate and return through the mirror with a warning to prevent the same fate from happening in his own reality. Korush'nai: Goa'uld warning, meaning "turn back", used to indicate any planet destroyed by the Goa'uld and left contaminated by radiation. The lab on P3R-233 contained tagged artifacts from diverse human cultures, including a Turkinese mask, a clay cone from Nagash with cuneiform symbols, and a mirror, possibly made of naquadah, which allows interdimensional transport to alternate realities. Scientists have theorized that there are an infinite number of dimensions, each containing a different possible version of reality, some of which are very different, and some of which are almost identical. Estimated death toll to Earth was 1.5 billion. Refugees from the Genesis list including world leaders, scientists and doctors, were sent to the Beta Site. Blasts from the Goa'uld destroyers are the equivalent of 200-megaton nuclear warheads. The unique symbol on a gate is its point of origin. A wormhole can be maintained for 38 minutes. The deep space transmission three months earlier from P3R-233 used a derivation of ancient Egyptian for the message: "Beware the destroyers. They come from 3, 32, 16, 8, 10, 12." Coordinates for the origin of the Goa'uld attack from a transmission from P3R-233 in the alternate universe correspond on their gate to 3-32-16-8-10-12. Daniel's drawings correspond on the Earth gate to 3-39-16-8-10-12. The stargate has an iris, and the SG-1 transmitter code was valid. O'Neill's son accidentally killed himself with Jack's gun. O'Neill led the suicide mission to Abydos to blow up the gate and destroy Ra. Catherine and Ernest had been engaged before the stargate accident in 1945. Teal'c has a wife and son Rya'c. Stargate Command is known as SGA. O'Neill is a general, Hammond is a colonel, Carter is a civilian Ph.D. in astrophysics. Jack and Sam are engaged. Daniel met Catherine but rudely refused to join the team translating the Giza cartouche. Daniel, last known residence Egypt in 1997, was killed by the Goa'uld attack. Teal'c remained First Prime of Apophis and led the attack on Earth. O'Neill has a scar over his left eye, Carter has long hair, Teal'c has a pony tail. There was no mission to Chulak. A bomb was sent through the gate to destroy Chulak. All of SG-1 and Earth were destroyed in the Goa'uld attack. Wonder what's behind curtain number two?